Special Event Sunday! 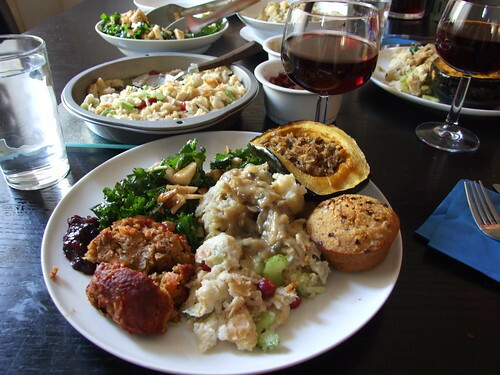 Vegan Thanksgiving – vegan in your city. We did our small thanksgiving a little early (today), because J has his family’s one on Monday (the real day). 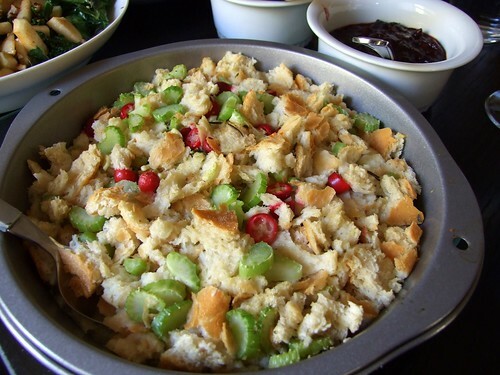 I’m not a big fan of the smell of roasting turkey, to the point that it makes me pretty nauseous, so I’ll be skipping the big family event tomorrow and spending it chopping cranberries finely and sprinkling them all over one of Emmie’s wet food cakes in an attempt to be Thanksgiving festive. Last year I prepared a feast for myself, and ate it while house/cat sitting during other people’s long weekend getaways. This time, I tried to cook, while fasting for Yom Kippur, preparing a Break Fast meal (vegan matzo ball soup), and also cat sitting during other people’s long weekend getaways. Goal for next year: leave town. (I’m kidding… or am I?) 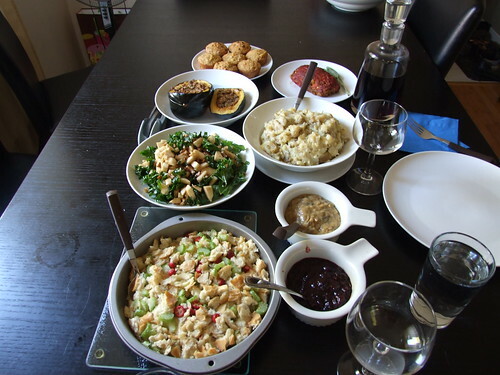 Real goal for next year: Invite people over for a Turkey-less vegan thanksgiving. – Cornbread Muffins, solely because I love them and they make me happy. 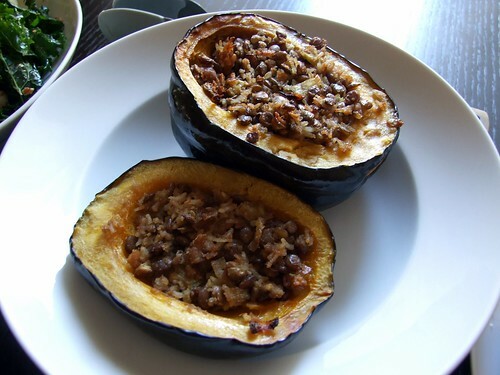 – Stuffed pepper squash. Originally planned to make this cranberry-pear rice stuffing, but ended up making a lentil white rice stuffing with spiced veggies. 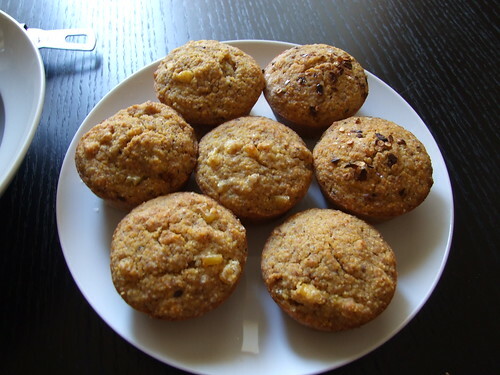 – The Apple Walnut Kale salad from Cupcakes and Kale listed below, except I used pecans and skipped the green onions. Remember to massage your kale! – Two mini lentil loaves based on this recipe from My Vegan Cookbook. I skipped the red and green peppers and put celery, mushrooms, and carrots instead. 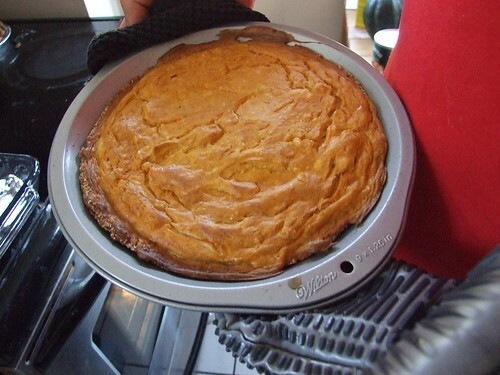 – J made a beautiful layered pumpkin pie cheesecake with an oatmeal cookie crust – I’m sure there will be more pictures of this one, once it cools. I was so happy with the end result, my plate was covered in delicious food, and by the end of my meal I was pleasantly full, and not in a food coma. Sometimes it’s a struggle to decide what to make for special holidays, in my case it’s a struggle to decide what NOT to make. Either way, MoFo’ers are full of great ideas! So if you’re still searching for something for tomorrow (or for American Thanksgiving next month!) check out these recipes/suggestions. They all look so awesome. A Savory Seitan Kale Galette from Happy Vegan. 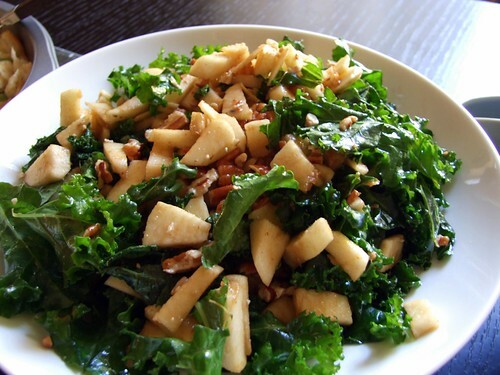 An Apple Walnut Kale Salad from Cupcakes and Kale. Sweet Potato Casserole from What Your Momma Didn’t Know. MoFo’er Monday! 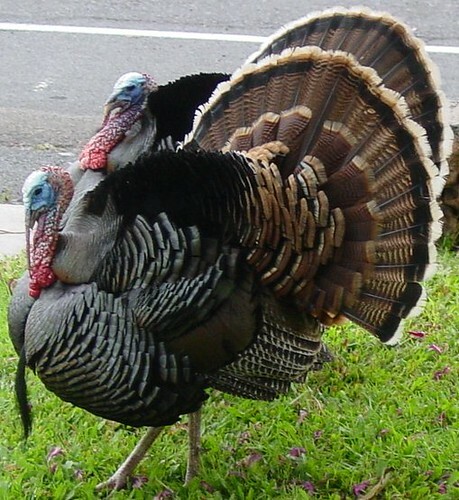 Thanksgiving for Everyone! What a beautiful feast! Everything on your menu sounds incredible. I hope you get to enjoy the leftovers all weekend long. Wow, everything looks amazing! What a feast! I'm going to be checking out the recipe for the apple kale salad (yum!) 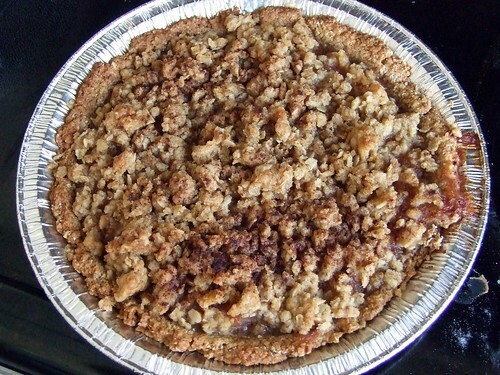 and your Apple Crumble Pie looks fantastic. I'm so impressed! What a meal. What matzoh ball soup recipe did you use last year? VWAV? Beautiful photos, delicious looking dinner! I am smelling a roasting turkey right now and wish I wasn't. wow, you went all out making so many dishes! 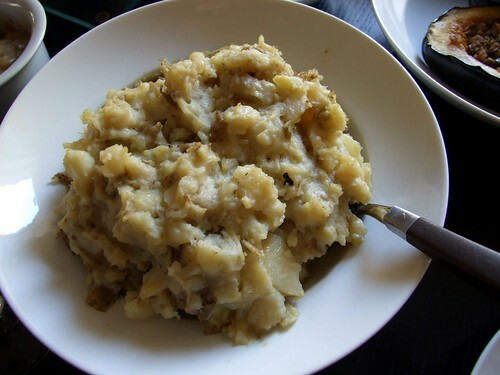 mmm, and i feel like i can smell those garlicky smashed potatoes through the screen 🙂 i'm incredibly honoured that you included one of my dishes in your thanksgiving feast. happy thanksgiving to you & yours! xo. Everyone: THANK YOU! 🙂 It was great to prepare, and even greater to eat! Lisa: We did enjoy leftovers today. It was even tastier! Vegan.In.Brighton: That apple crumble pie is totally your fault! If you hadn't blogged about the tart at your farmers market, I'd never have made it! Jess – Thank you for the ideas! Your spread looks so good! I want to come over to your house and help eat the leftovers. You can have some of mine if I can have some of yours. 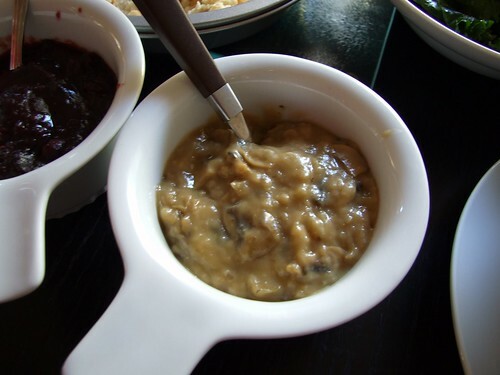 🙂 And really, two stuffings… genius. That's always one of my favorite parts. Wow, you sure know how to feast. 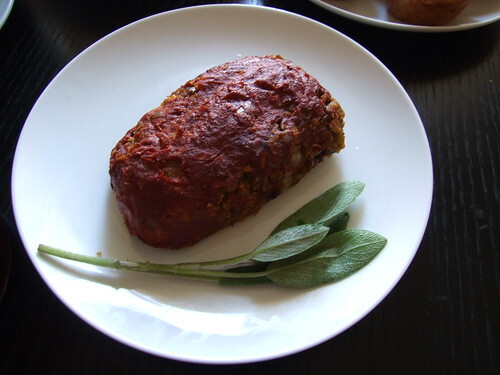 Particular stand-outs to me are the stuffed squash and gorgeously plated lentil loaf!